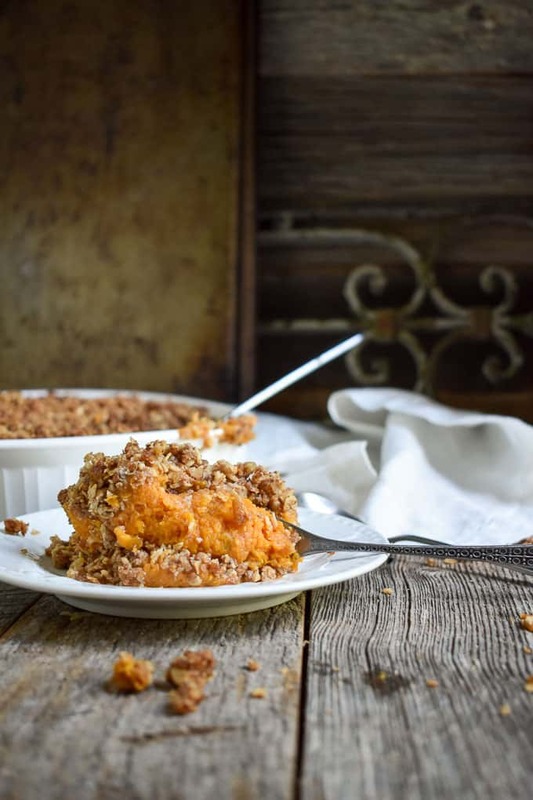 Vegan Sweet Potato Casserole topped with a crunchy pecan crumble. It’s THE perfect holiday, or anytime, side dish. Low-fat, plant-based, healthy, and delicious. Fall is right around the corner and I can hardly wait. The changing leaves, flannel shirts, and most importantly – the FOOD! Autumn has given us some of the best casseroles and side dishes in the world. 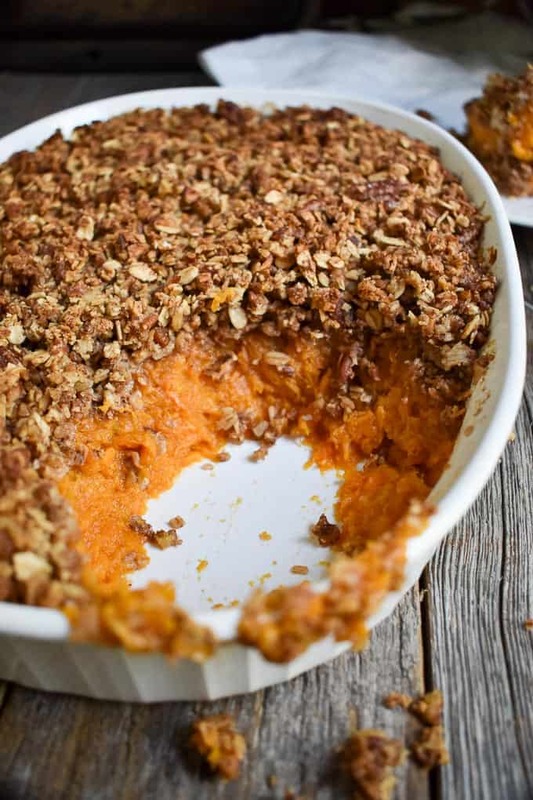 But, the one that makes my happy parts tingle is this Vegan Sweet Potato Casserole! Truth be told, I HATED sweet potato casserole growing up. I don’t know why. But, it was the one Thanksgiving dish I despised as much as aunt Sally’s nasty jello and marshmallow salad. UGH! What the hell?!? Who thought that was a good idea? OK, rant over. Later on something changed and I fell in love with it. 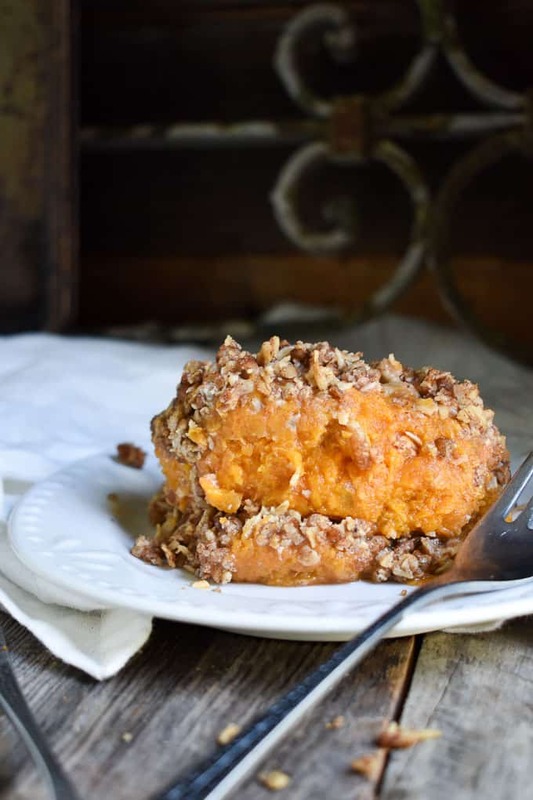 The sweet potato casserole, not the jello crap. 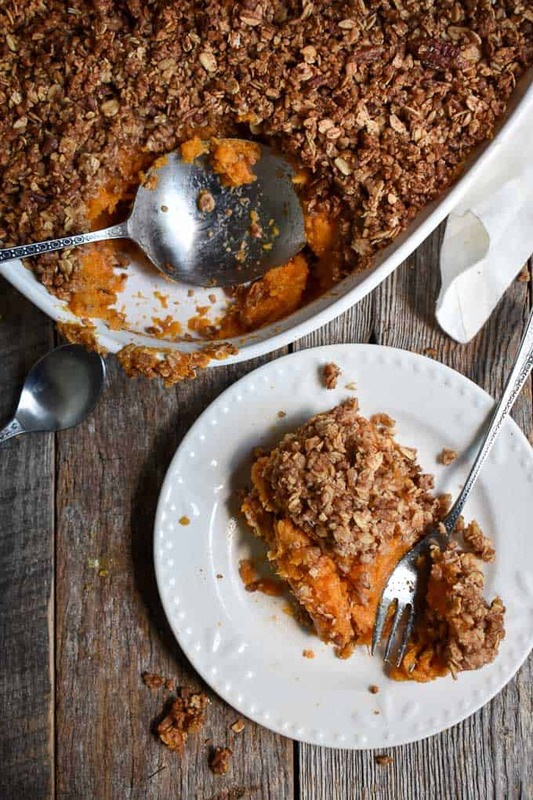 I started looking for vegan sweet potato casserole recipes after switching to a whole foods, plant-based diet. And, quite honestly I was a little discouraged. 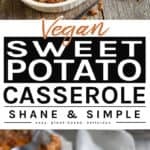 Most of the vegan recipes contained a lot of processed crap and weren’t any healthier than a regular sweet potato casserole. So, after a lot of experimenting I finally settled on a recipe I absolutely love. And, I couldn’t believe how simple it was. This recipe accomplishes everything I hoped it would. It’s less than 10 ingredients. Whole foods and plant-based. Healthy. Super easy to make. And, most importantly, DELICIOUS! Delicious sweet potatoes are the primary ingredient. Some Cinnamon and nutmeg highlight the sweet potatoes without over doing it. A little vanilla and some maple syrup for added sweetness. And, there you have it. The topping is a delicious crunchy pecan crumble that’s so simple to make. Just toss some oats, pecans, cinnamon and maple syrup into a food processor and blend. That’s it. You’ve got an amazing pecan crumble topping. 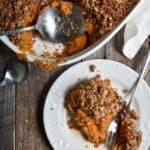 Top the mash with the crumble and throw it in a 375 degree oven for 20 minutes and you’ve got one amazing vegan sweet potato casserole. This recipe is great for Thanksgiving, but it’s perfect for any occasion where a side dish is required. Fall gatherings, weeknight meals, and even brunch. I guarantee it won’t last long. And, no one will ever know it’s actually good for them. 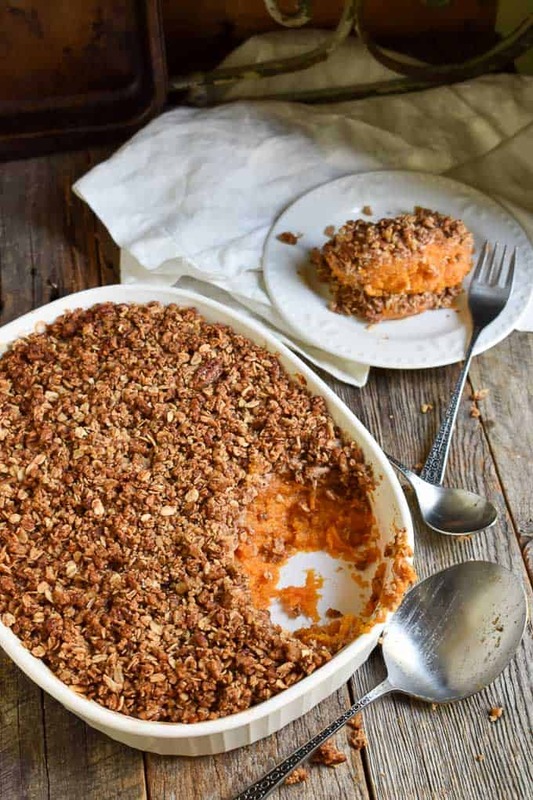 This Vegan Sweet Potato Casserole with a pecan crumble topping is the perfect holiday side dish. Dairy free, low-fat, uses no refined sugar, plant-based, vegan and absolutely delicious. Preheat oven to 375°F. Lightly spray 9×11 casserole dish or use one that is non-stick. Prepare the crunchy nut topping: Pour oats into a food processor and pulse until coarsely chopped. In a mixing bowl, add the chopped pecans, oats, cinnamon, salt and stir to combine. Pour in the maple syrup. Mix until combined, using your hands if needed. Set aside. Drain the cooked sweet potatoes and place in a large mixing bowl and mash until smooth. Stir in the maple syrup, vanilla, cinnamon, nutmeg, and salt. Adjust to taste if needed. Dump into casserole dish and evenly smooth out. Sprinkle the crunch nut topping all over the sweet potato mixture, evenly. Bake, uncovered, at 375°F for 20 minutes, until the dish is hot throughout. Plate and serve immediately. This is SO delicious! Will be on my holiday table for sure. Can’t believe this is plant-based eating. I have made this twice. So dang good!!! Will definitely be in the regular rotation from here on out. Thank you! Thank you, Shanie! So glad you enjoyed it. And, you are most welcome. Thanks again for reaching out. Peace. How large? 4-5 lbs for all of them? Janet, I think 4-5 large sweet potatoes would be somewhere around 4 pounds or so. 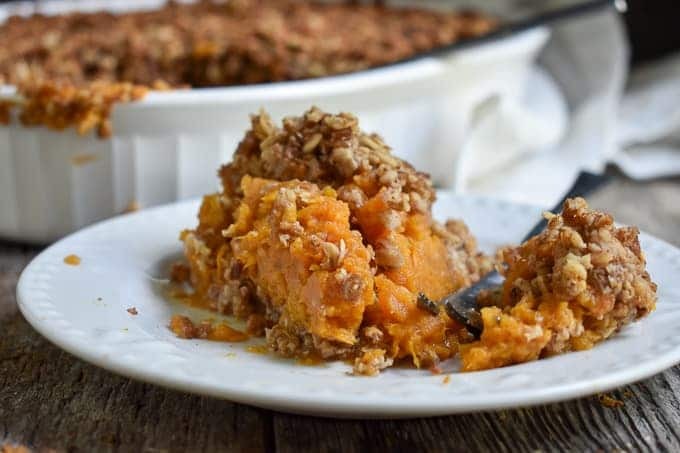 Can you make the topping the day before and sprinkle on top of the sweet potatoes just before baking? Sure. Just store in the fridge. It may stick together but just break it up and sprinkle on top. Should be no problems. Do you think gluten free oats would work as well? Yes, they should work just fine. I don’t see any reason why they wouldn’t. Can this be made a couple days ahead of time. Thoughts on replacing the pecans? Allergies.. extra oats ? Pretzels? Thanks! Looks great! Do you think quick oats would be an ok substitute for the rolled oats? I think they would work fine. Made this on Thanksgiving for my non-veggie eating family and everyone LOVED it! Thank you! That’s so great to hear. Thanks for sharing!